We have had a great week here at Camp Buck Toms all the boys have got a lot of merit badges done which is helping them gain in rank. We have had fair weather. These past two days have been the only rainy days. The food has not improved at all but Mr. Nutley came in clutch again with cooking up the last bit of chicken wrapped in bacon. It was delicious! The troop was also awarded two awards during our stay this week. A merit award, and an honor award. Each award had the troop fulfill a set of requirements. Among them, was our troop service project where we dis-assembled and re-located a “human foosball” court. Another requirement was to host an multi-troop event. We pulled out our ping-pong table and had a tournament with troop 285 while it rained. Here I am with Ace. For this last update I am going to interview myself. 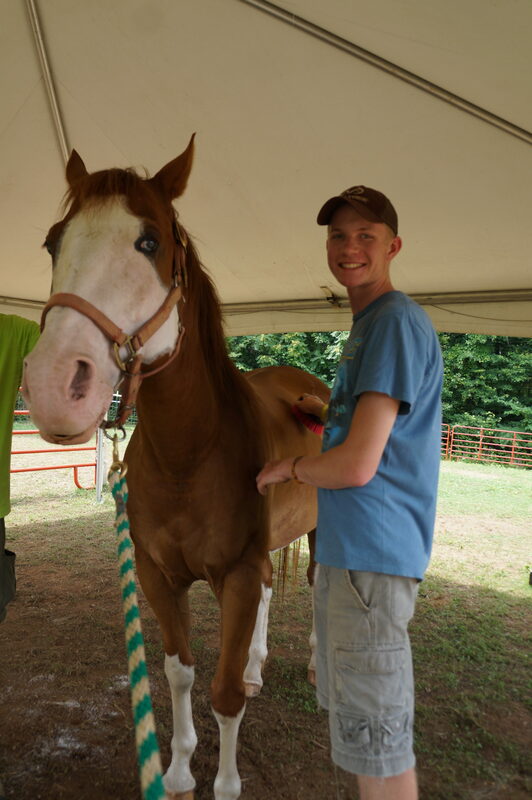 My favorite part of camp was horsemanship. My favorite part of this badge would be riding the horses. I also enjoyed the rest of this badge that covered the medical and health aspects to saddling up and riding. I would highly recommend this merit badge to any other scouts, It was awesome! I came to camp this year to mostly work on some small requirements that are going to hep me get closer to achieving my Eagle scout rank. This is also my last summer camp and i’m happy I got to spend it down here In Tennessee at Camp Buck Toms. In my years of scouting my favorite camp has become Camp Buck Toms. I have liked It ever since I came here back in 2012. I like it because the camp sits right on Watts Barr lake, The lake and the mountains make it beautiful! Now we are all packing up tonight and getting ready for tomorrow, our big day of travel back to Indiana. Keep us in your prayers that our packing and organizing go well and our drive home is safe. As I stated before, it has been a great week and we got what we came for and some!